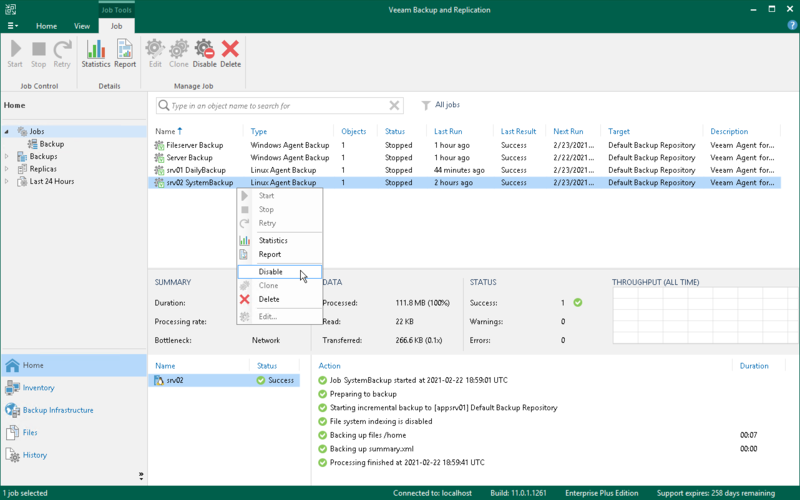 You can disable and enable Veeam Agent for Linux backup jobs in Veeam Backup & Replication. When you disable the job, you prohibit the user to store the resulting backup to the backup repository. If the user starts a disabled job manually or the job starts by schedule, the job session will fail and report the "Job is disabled on backup server" error. To let Veeam Agent for Linux store backups to the backup repository again, you must enable the disabled job. In the inventory pane, click the Jobs node. Select the necessary job in the working area and click Disable on the ribbon or right-click the necessary job in the working area and select Disable. To enable the disabled job, click Disable on the toolbar or right-click the job and select Disable once again.